Each year, tens of billions of dollars are lost from employee absenteeism due to illness. While companies attempt to manage this issue, a big part of the challenge is trying to anticipate when workers will be out sick. A new partnership between Sickweather and Unum (NYSE: UNM) helps manage this predicament. Sickweather is the world’s first real-time map of human health, tracking reported illnesses and symptoms to provide geographically specific information about what’s going around. That information can be used to forecast a range of health-related factors for a variety of industries. 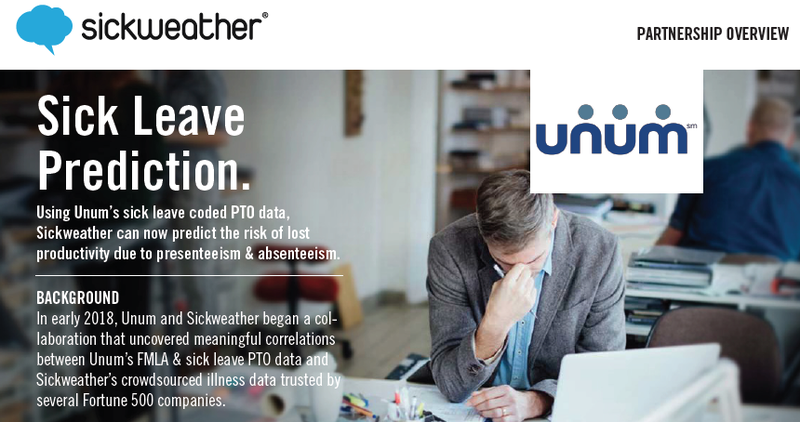 Unum, an international provider of financial protection benefits for companies has initiated a pilot project using Sickweather data to predict employee absence due to sickness. The initiative is designed to give managers more data and insights to plan for absenteeism. The concept of using illness prediction technology for staffing is novel and has the potential to provide financial benefits for companies with large employee populations, especially for shift-based roles. With employees being one of the largest expenditures for many companies, even a small improvement in staffing efficiency can affect financials significantly. The technology will launch this month as a closed pilot with at least five of Unum’s clients representing over 80,000 employees across 45 states. *Contact Sickweather’s Chief Revenue Officer Laurel Edelman at 484.653.8707 or ledelman@sickweather.com for more information.